The United States emerged from World War II as the most powerful nation in the world. There would be no return to isolationism and withdrawal from world affairs as after World War I. The four-power agreements among the Allies hence forth required the continuous presence of American troops in Europe. Moreover, the Army assumed the tremendous task of administering the military governments of Germany, Austria, Japan, and Korea. Having learned from its failure to support the League of Nations, the United States spearheaded the effort to form the United Nations. Through such programs as the Marshall Plan, the United States also helped to rebuild the world that the war had shattered. Despite its prominence in international affairs, the nation soon began to dismantle its global military communications system. 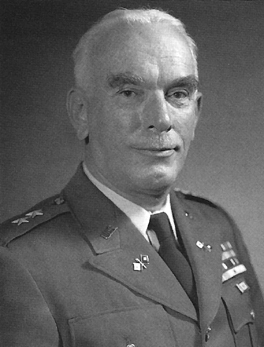 To many signal officers, particularly Maj. Gen. Frank E. Stoner, wartime administrator of the Army Command and Administrative Network, the policy was shortsighted.1 Yet while the Army's ability to communicate around the world was disconnected, the technological revolution sparked by the war heralded amazing changes for the future. During the next fifteen years the Signal Corps' domain would come to include the heavens as well as the earth. 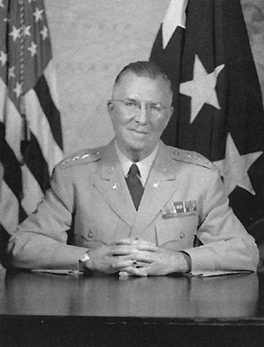 In the midst of these changes, General Ingles oversaw the Signal Corps' transition from a wartime to a peacetime basis. By 30 June 1946 the Corps' strength had dwindled to just over 56,000 officers and men, only about one-sixth of the total a year earlier.5 Due to postwar curtailment and consolidation of the Corps' activities, many of its field agencies and training facilities were discontinued, including the Central Signal Corps School at Camp Crowder.6 The Corps consolidated all of its training at Fort Monmouth, except for the small supply school at Fort Holabird, Maryland.7 In addition, the Signal Corps lost both personnel and functions to the Air Force and the Army Security Agency. 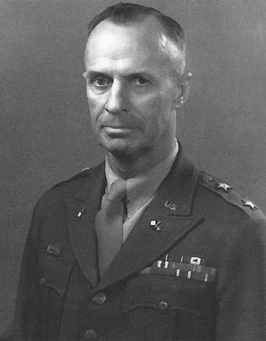 Having guided the Signal Corps through the immediate postwar period, General Ingles retired from the Army on 31 March 1947. 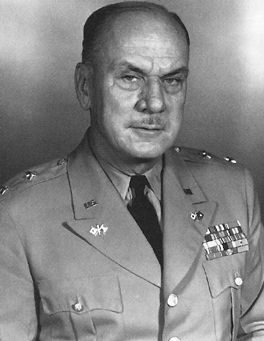 Thanks to his wartime association with David Sarnoff of RCA, Ingles began a new career as a director of RCA and president of RCA Global Communications, Inc.19 The new chief signal officer, Maj. Gen. Spencer B. Akin, had served with distinction on General MacArthur's staff during World War II and accompanied him to Japan after the war. Within a few years his knowledge of the Far East proved particularly valuable for the branch he now headed. Unfortunately, the tranquil peace hoped for after World War II did not materialize. New international tensions arose as the Cold War brought down an Iron Curtain between Eastern and Western Europe. The United States committed itself to the defense of Western Europe through membership in the North Atlantic Treaty Organization (NATO), whose forces stood aligned against those of the Warsaw Pact formed between Russia and its satellites. Crises such as the Berlin blockade (1948-1949) and the victory of the Communist forces led by Mao Tse­tung (Mao Zedong) in the Chinese civil war (1949) cast an ominous pall over world affairs. In that same year, Russia detonated its first atomic bomb, ending the U.S. monopoly over nuclear weapons. The arms race had begun, and the threat of nuclear war thereafter became a constant concern. Meanwhile, the foreign policy of the United States focused on the containment of communism. Although the United States had anticipated and prepared for an outbreak of overt hostilities in Europe, the first armed confrontation involving the Army came thousands of miles away, in Korea. On 25 June 1950 North Korean forces invaded South Korea, and the resulting conflict remains one of America's least known wars. Yet it was a bitter one. Initially, the United States did not intend to become engaged in ground combat in Korea or to fight an extended war there. The United Nations, meeting on the afternoon of 25 June, adopted a resolution calling for a cease-fire and withdrawal of the North Koreans to the 38th Parallel. However, it soon became clear that South Korea's lightly armed forces could not stop the North Koreans. The South Korean capital of Seoul fell within a few days, and the Communist forces continued to push southward. On 30 June, to prevent the nation's downfall, President Truman decided to commit American ground forces. On 15 September 1950 the independent X Corps (comprising the 7th Infantry Division and the 1st Marine Division) carried out a successful landing behind enemy lines at Inch'on, and by the end of the month American and South Korean forces had recaptured Seoul.51 In coordination with the Inch'on landing, the Eighth Army initiated a breakout from its defensive perimeter on 16 September. As North Korean resistance deteriorated in the wake of the reverses at Inch'on and Seoul, the Eighth Army rapidly swept northward to link up with the X Corps. Disorganized, defeated, and demoralized, the North Koreans retreated behind their borders. Victory appeared to be at hand as UN forces crossed the 38th Parallel into North Korea early in October, entering the capital of P'yongyang on the 19th. In order to completely destroy the North Korean armed forces and reunify Korea, UN troops continued to advance toward the Yalu River on the Manchurian border. MacArthur announced that the war would be over by Christmas, but his optimism proved tragically premature. The war suddenly took on a new dimension when China intervened, as it had threatened to do if UN forces invaded North Korea. South Korean troops heading for the Yalu first encountered Chinese soldiers on 25 October.52 Battle hardened veterans of the recent civil war, the Chinese Communist Forces (CCF) soon attacked the UN units in large numbers. Despite the lack of air support and tanks, and with very little artillery, the Chinese defeated the Eighth Army in western Korea and the X Corps at the Chosin Reservoir in late November. They then pursued MacArthur's forces back across the 38th Parallel and by early January had regained control of Seoul. Instead of celebrating the holidays and victory at home, the UN troops fought on throughout the harsh Korean winter. Despite Eighth Army's recent successes, the conflict became increasingly unpopular at home. MacArthur supplied additional controversy with his criticism of Truman's war policy, which led to MacArthur's relief as the theater commander and replacement by Ridgway.58 Direct Soviet involvement remained a dire possibility that could lead to World War III, but fortunately did not occur. With neither side able to secure a decisive military advantage, truce negotiations began in July 1951 and continued for two years. In the interim, fighting persisted on a limited scale. Many lives were lost in such bitter engagements as Heartbreak Ridge and Pork Chop Hill, but the battle lines remained virtually unchanged. In the end, diplomacy halted the Korean War, with victory for neither side. 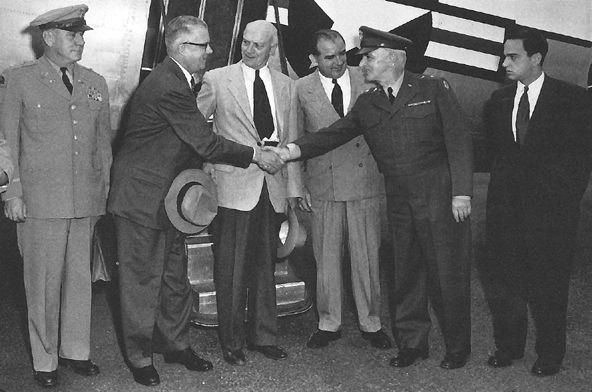 Early in 1953 newly elected President Dwight D. Eisenhower traveled to the battlefront to fulfill a campaign pledge. Following his visit and a veiled threat to use atomic weapons, the belligerents finally signed an armistice agreement on 27 July 1953 at the village of Panmunjom. 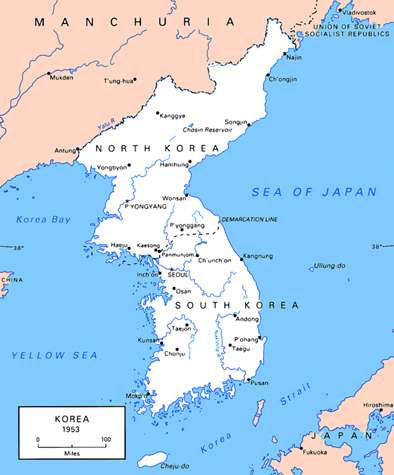 According to its terms, Korea remained divided by a demilitarized zone roughly following the 38th Parallel. After preserving the independence of South Korea, the Eighth Army remained to enforce the peace. Its signal units continue to provide the U.S. forces stationed in that country with a sophisticated communications system. Based upon wartime efforts, the post World War II era witnessed revolutionary advances in science and technology. The Signal Corps, having already proven that it could send messages anywhere in the world, now looked to the heavens for new frontiers in communications. But the Soviet Union took command of the heavens first. Its successful launching of Sputnik on 4 October 1957 shocked the nation. Senator Lyndon B. Johnson of Texas, who soon began an inquiry into satellite and missile programs, called the event a "technological Pearl Harbor. "65 If the Russians could send satellites into space, some argued, then they probably could launch long-range missiles capable of destroying the United States. Many Americans reacted strongly to this perceived threat and wanted to match the Soviets as quickly as possible. As the "space race" began in earnest, the Cold War acquired cosmic complications. NEW JERSEY, 1959. 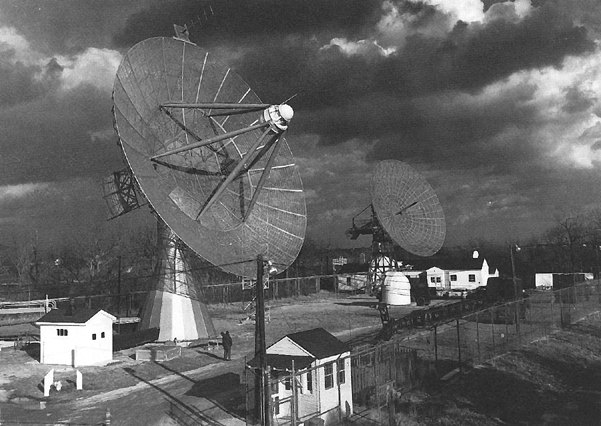 THE PARABOLIC ANTENNAS TRACKED THE EARLIEST U.S. AND SOVIET SATELLITES. of the Korean War. But these numbers soon began to dwindle as the inevitable postwar reductions took effect. With the drawdown the Corps closed its schools at Fort Holabird and Camp San Luis Obispo.81 The Korean War stimulated, however, a long-term expansion of the Signal Corps' research and development program, whose budget nearly doubled between 1955 and 1959.82 The introduction of increasingly sophisticated electronic devices seemed to change the nature of communications almost overnight. Moreover, the proliferation of these devices throughout the Army engaged the Signal Corps in several new areas of operation. For years the Corps had carried out its scientific experimentation in the three laboratories at or near Fort Monmouth: Coles, Evans, and Squier, known collectively as the Signal Corps Engineering Laboratories. 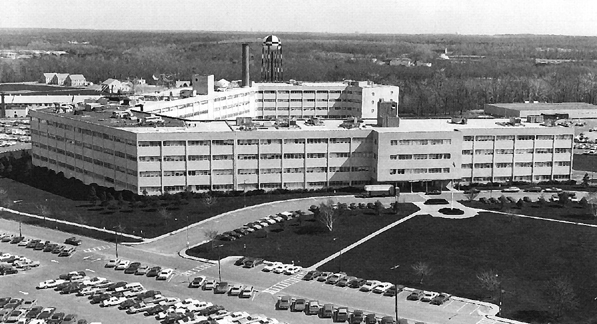 To centralize their operations, they began moving into a new, specially designed building at Fort Monmouth in 1954, known as the Hexagon.83 In 1958 the Army redesignated this facility as the U.S. Army Signal Research and Development Laboratory.84 There the Corps pursued a long-range program that emphasized advances in the areas of miniaturization and systems integration. gus.87 Composed of several layers of material, it can be thought of as an electronic sandwich. 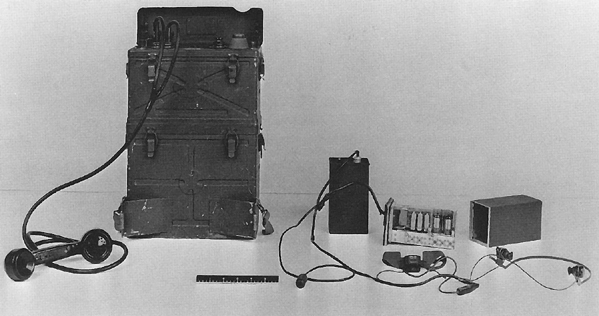 Rugged, reliable, and portable, the transistor met the demands of battlefield communications. 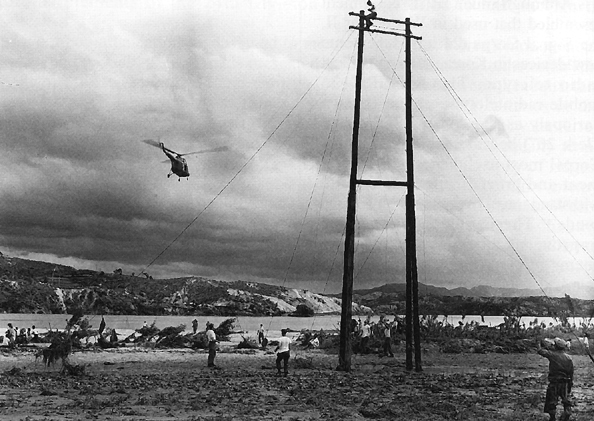 On and off again like the weather itself, the Signal Corps' meteorological activities resurged in the post Korean War period, in part to support the expanded Army aviation program. 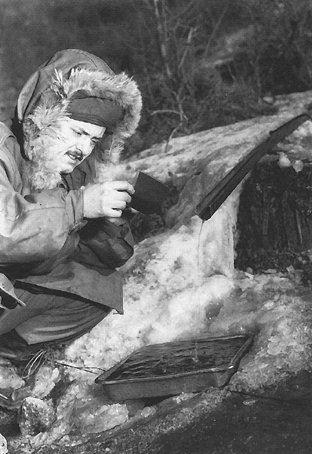 Although the Air Force provided operational weather support for the Army, the Signal Corps supplied the associated communications. 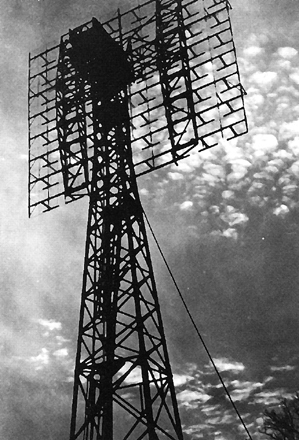 As it had since 1937, when it lost control of most of its weather-related activities, the Signal Corps remained the primary agent for Army meteorological research and development.102 The Corps conducted much of this work in the Meteorological Division of the laboratories at Fort Monmouth, with some aspects assigned to the proving ground at Fort Huachuca. Since weather affects even the most sophisticated communications-causing distortion or disruption-the Signal Corps needed to learn more about such phenomena, and the curriculum at Fort Monmouth included courses in meteorological observation. In 1957 the U.S. Army Signal Corps Meteorological Company, the only unit of its kind, was formed at Fort Huachuca. Its nine teams were scattered around the globe to supply meteorological support for special testing exercises.103 The Signal Corps even explored ways to control the weather, joining with the Navy and General Electric in cloud-seeding experiments.104 Besides weather prediction, information about winds and conditions in the upper atmosphere proved crucial to missile guidance and control. The influence of weather upon radioactive fallout also warranted serious study. 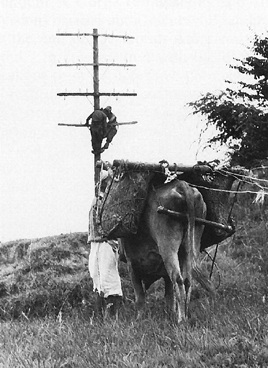 The post-Korea era also witnessed the invasion of a new and powerful communications medium into American homes. 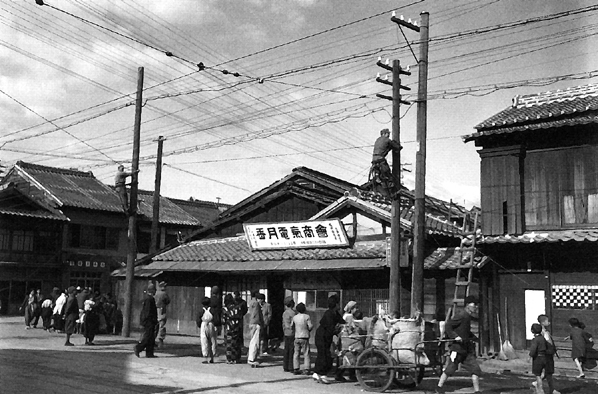 The economic restrictions imposed by World War II and Korea and the consequent diversion of raw materials to war production had delayed television's widespread commercial introduction. With peacetime, television boomed. Glowing cathode-ray tubes increasingly became a fixture in America's living rooms, and mass communication took on a new face. Along with its achievements in space during the 1950s and early 1960s, the Signal Corps pioneered in the field of electronics and its military applications. The Corps' role in the development of the transistor and the use of computers for information processing produced fundamental changes in the nature of communications technology, the effects of which are still being felt. Modern weaponry and equipment enabled the Army to fight more effectively despite its shrinking size. Active strength dropped below 900,000 in 1958.119 At the same time, greater reliance on high technology increased the demand for skilled communications-electronics specialists. 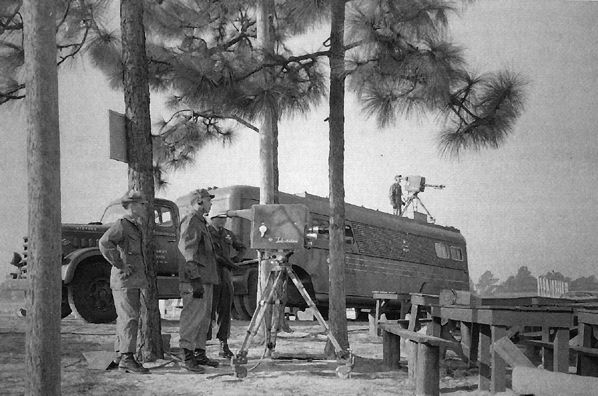 The Signal Corps revised its training curriculum accordingly, adding such courses as atomic weapons electronics, electronic warfare equipment repair, and automatic data processing. 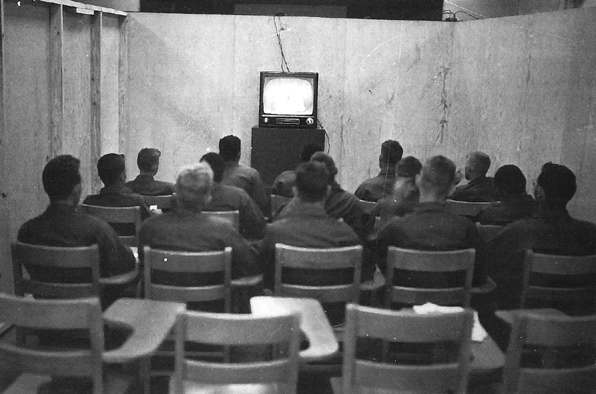 During the four years from 1955 to 1959 the Signal Corps trained 9,000 officers and 99,000 enlisted men at its schools.120 Yet a shortage of skilled communicators became a chronic problem as the Signal Corps competed for personnel with the higher-paying civilian electronics industry. GENERAL LAWTON'S RIGHT. CHIEF SIGNAL OFFICER BACK IS SECOND FROM LEFT. of communism became a national obsession. The trial and conviction of Julius and Ethel Rosenberg in 1951 for passing atomic secrets to the Soviet Union, played out against the backdrop of the Korean War, heightened the nation's fears. Even the couple's execution in 1953 did little to reassure the American public that the Communist menace was not omnipresent. In that same year the new president, John E Kennedy, and his secretary of defense, Robert S. McNamara, set out to reorganize and strengthen the armed forces to allow for a more flexible response to international crises. Concurrently, McNamara initiated far-reaching managerial reforms within the Defense Department that shifted power from the military services to the civilian bureaucracy. 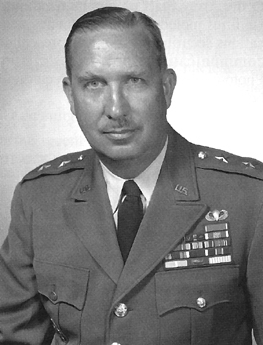 In conjunction with these changes at the higher levels, McNamara directed a thorough reorganization of the Army Staff. On 16 January 1962 President Kennedy submitted a plan to Congress that abolished the technical services, with the exception of the Medical Department. Congress raised no objections, and the reorganization became effective on 17 February. Although the positions of the chief chemical officer, the chief of ordnance, and the quartermaster general all disappeared, the chief signal officer and the chief of transportation were retained as special staff officers rather than as chiefs of services. 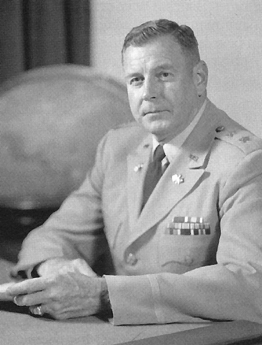 The chief of engineers retained his civil functions only, while the chief signal officer now reported to the deputy chief of staff for military operations (DCSOPS).132 By eliminating the technical services as independent agencies, McNamara succeeded where Somervell and others had failed. officers from all the major staff elements in the Department of the Army, the so-called Powell Board (for General Herbert B. Powell, commander of CONARC) made recommendations that resulted in further modifications to the organization and operations of the Signal Corps. Relieved of his Signal Corps operational duties, the chief of communications-electronics could adopt an Army-wide perspective. Concurrent with the reorganization of the Army Staff, the Army's tactical divisions underwent restructuring. Early in 1962 the Army began implementing the Reorganization Objective Army Divisions (ROAD) plan. The battle groups of the pentomic divisions had proven too weak for conventional war, and the Kennedy administration's strategy of flexible response emphasized the waging of atomic wars only as a last resort. Hence the Army formed four new types of divisions: infantry, armor, airborne, and mechanized, each with a common base and three brigade headquarters. The division base contained the support units, including a signal battalion comprised of three companies, one to support each brigade.140 The Army was still in the throes of these changes when a new series of crises threatened the world with war. With tensions in Europe and the Caribbean abating somewhat, the focus of the Cold War once again shifted to Asia. If Korea had seemed remote to most Americans in 1950, then Indochina-Vietnam, Laos, and Cambodia-evoked a similar reaction in the early 1960s. In just a few years, however, there would be few Americans who remained unaware of its existence. As U.S. involvement expanded in Southeast Asia, Army communicators became an integral part of the process-applying the latest technology in a conflict that pitted the world's most sophisticated power against a seemingly backward, primitive foe.